It’s well established that overfishing is destroying the oceans’ marine populations. To make matters worse, we now know that over a third of all fish pulled from the seas are never consumed. The statistic comes courtesy of the United Nations Food and Agriculture Organization, which regularly releases updates on the global fishing industry. Depleting the ocean is bad enough, but having roughly 35 percent of all fish caught not even nourish other life makes the situation even more tragic. The majority of the waste is attributed to rot – you wouldn’t believe how often fish spoil before they go to market. Either broken refrigeration equipment fails to keep the fish fresh or inexperienced workers just fail to use the equipment properly. The other waste is due to fish being thrown overboard. Don’t confuse that with catch and release – the problem is that fish are pulled onto a boat, are kept out of the water long enough to die, then fishers toss them back because either they’re not the right kind or size. The UN’s report also concludes that fish “production” is the highest it has ever been – with a growing global population, the demand for food also increases. To accommodate this growth, the world continues to turn to fish farms, enclosed pools of water where fish are bred specifically for consumption. However, even that has an impact on the wild fish population, since the captive fish are often fed smaller wild fish like sardines and anchovies. In other words, the oceans are further being depleted to keep the farmed fish industry thriving, which is obviously a contradiction. The UN’s José Graziano points out, “Since 1961, the annual global growth in fish consumption has been twice as high as population growth.” By the UN’s estimation, the demand for fish will be up another 20 percent over the next dozen years. 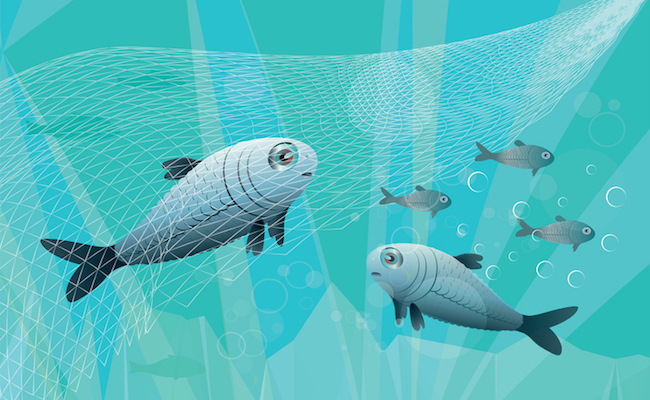 The booming human population and shrinking fish population are totally at odds. For that reason, a third of (commonly consumed) fish species are considered “biologically unsustainable” at the rate they are being pulled from the ocean. A seafood restaurant’s menu is liable to look quite different in the decades ahead than it does currently. Another important bit of information from the report is that fish populations are leaving tropical waters because the ocean’s temperatures in these areas are getting too hot. This relocation is a problem since the countries in these regions tend to be the most reliant on fish as a source of nutrition. While the solutions to these problems aren’t simple or obvious, these are definitely issues that need to be talked about since they’re not going away. What a sin. If you need to eat, take what you need, use all you take. The only solution is stop fishing. Go vegan and let the other live their own lives in peace.